to combine them, but it turned the other way. They look so cool and unique, I was really surprised. I'm wearing here. It's made by this cute girl from Asos. Oh and this cutest Abataba ring. Gorgeous sweater and cardigan! You look wonderful! Super outfit, dzemper je savrsen! You look great girl! I keep saying, but you're very pretty! Love your tweed jacket! You look amazing! You are so right, perfect pop of color! Absolutely perfect! Those boots are just incredible. seriously! all your photos look totally professional! Doc M never disapoint you ! A really cool outfit!!! I love the mix of colours! The yellow knit is amazing! Wow!!! Amazing pics and look! LOVE the bow tie! so cute. amazing look! and I love your pictures! 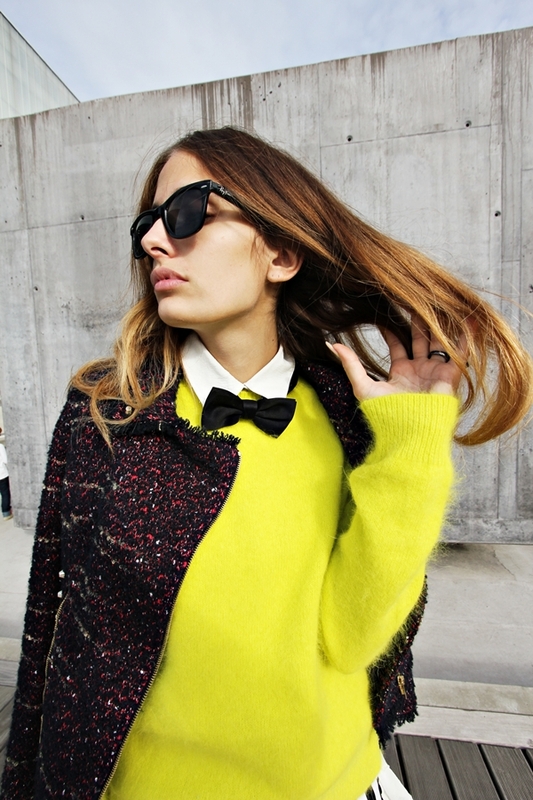 What girl could possibly wear a bow tie so gorgeously--love it!! Lovely pullover. I love the colour. kisses from Ely. Your pictures are getting prettier every time! Nice colors, and a whole outfit looks simply great! great outfit!!!! love this knitewear and skirt!!! wooww!! never see a combination like this before..and i love the angle of the shot too.. love it!!! omg this outfit is fab!! I'm obsessed with this look! That sweater and jacket are amazing and the way you styled this whole outfit is perfect. You look stunning. You have a really nice blog! I love the look, the yellow sweater is amazing!